Enjoy A Restful Break Anywhere You Are With A Blissful Being Silk Eye Pillow! Working in front of a computer screen all day long? Hate puffy eyes and dark circles? Stubborn headaches hindering your every move? Well, that wouldn't be the case if you had one of our wonderful eye pillows, right? Infused with lavender and flax seeds, this soft eye pillow will freshen your vision, relax your eyes and promote a feeling of wellbeing. Soothe Eye Irritation, Improve Vision & Enjoy Life To The Fullest! Our eye pillows have a sedative effect on the nervous system. Cut out light and enjoy a rejuvenating nap right away! Would you like a heat treatment or a cold therapy? It's all up to you. You can either freeze the eye mask to cool off your troubled mind and get rid of migraines. Or microwave it for 30 seconds to tranquilize the nerves, relax and even balance your body! · ... soothe tired and puffy eyes. · ... relax body and soul. Reduce stress and sleeplessness. Enjoy sound sleep! · ... take it with you everywhere you go. Relaxation on the go. · ... treat eye soreness and itchiness, eliminate swelling, fight migraines and headaches. · ... enlighten mood, become more productive and joyful again. What are you waiting for? Get yours today! Makes a thoughtful party favor or birthday gift!  SOOTHE TIRED EYES: Fed up with puffy and tired eyes? Get yourself this luxurious eye pillow and treat your precious eyes with nothing but respect. Soothe your eyes after a long day at work, eliminate tension and relieve persistent irritation or itchiness right away!  CONFORMS TO YOUR NEEDS: Unlike sleeping masks, this eye wrap rests over your eyes without exerting pressure. Just lay back, place the silk eye pillow on and enjoy! Reap the plethora of benefits in the comfort of your living room. Choose among our 8 glistening jewel tone colors or simply get them all.  CALM BOTH BODY & SOUL: Combining Lavender and Flax Seeds, this eye sleep pillow is here to accommodate even your most demanding needs. Lavender will help you reduce anxiety and insomnia, whereas the Flax Seeds will revitalize and boost your vision. 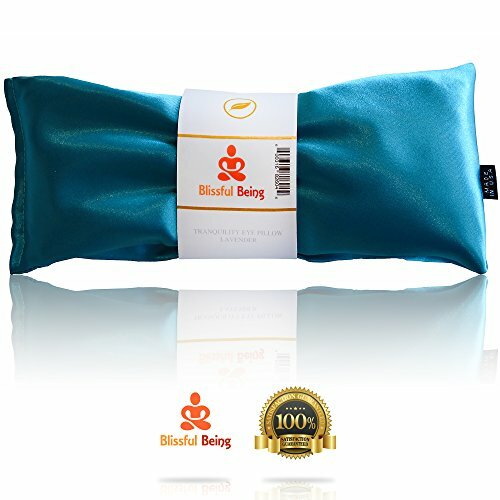  CHOOSE ITS PURPOSE: Our eye pillow mask is extremely easy to use and carry along. Ideal for travel and long car trips, after Yoga, Pilates or meditation, perfect for napping and resting your eyes. Have a relaxing break at the office and feel rejuvenated again. This eye mask is microwavable and freezable for better and long lasting results.  GET THIS EYE PILLOW RISK FREE: Proudly made in the USA, this Lavender and Flax Seed satin eye pillow is a must have for all women and men! Since your satisfaction is our top priority, this product is backed by our unconditional money back guarantee policy! If you have any questions about this product by Blissful Being, contact us by completing and submitting the form below. If you are looking for a specif part number, please include it with your message.